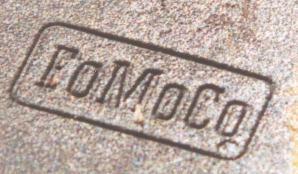 Ford automatic transmission flywheels are identified with basic part number 6375. All 428 Cobra Jet and Super Cobra Jet engines were originally externally balanced by Ford. That is, external components like the harmonic balancer and flywheel play an integral role in balancing the engine's reciprocating assembly. The CJ and SCJ flywheel balance weights are not identical: the SCJ weight is shorter, and the 1975 Ford master parts catalog says that the SCJ flywheel's diameter (15 1/2") is about 1/32" less than the CJ flywheel's diameter (15 17/32"). All of this means that they don't interchange directly without balance problems. 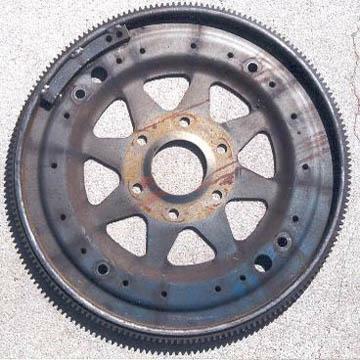 The balance weight on a CJ flywheel extends for approximately 20 teeth on the ring gear; the balance weight on an SCJ flywheel extends for approximately 16 teeth on the ring gear. The ring gear used for both flywheels has 184 teeth. 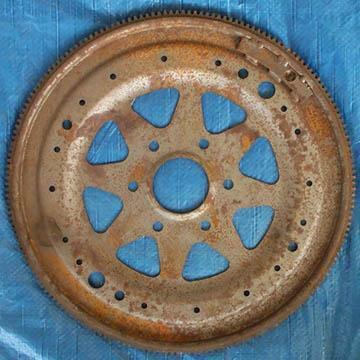 This particular flywheel was found in a 1968 Shelby GT-500KR, though the "C6SP-6375-A" number stamped here has also been identified for use on earlier base 428 and 428 Police Interceptor engines. Many thanks to Greg Sali for the CJ flywheel pictures used here!